The lastest study from the US Government's CDC reports that one in four Americans is now obese. After two weeks in the States I'm amazed it isn't a lot higher. America is one of the world's leaders in obesity trends, though Ireland is catching up. Whilst there are many explanations for the emergence of the global epidemic of obesity I have one more to suggest: lawyers. Whilst holidaying here in the States I tried to organise several activities for my daughter and niece involving horse riding. They're both very experienced - we've done it several times before on holiday. So imagine my surprise to be told by several horse riding centres and farms I rang that they no longer provide ride outs and trail rides because of litigation and insurance costs. I was told there was 'only one place left in Massachusetts' that was even prepared to offer the facility. That got me thinking: is there a correlation between the number of lawyers per capita and the incidence of obesity? 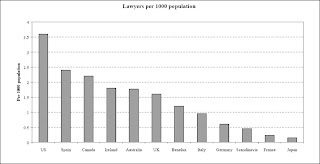 America leads the world in lawyers per capita (as the chart illustrates.) There are now nearly 1.2 million lawyers in the United States. I can't find a decent data set to run the correlations, and there are obvious definitional issues (we've got solicitors and barristers in Ireland, after all). Still, you do get the impression in America of a society that is terrified of the next lawsuit - even the menus in restaurants warn you that under-cooked meat can make you ill. Sure - and life is terminal: any other statements of the blindingly obvious you want to share with us? Japan is such a great country. Other than the whole schoolgirl wierd thing. That's just not right.